Cinnamon is the default desktop environment in the Linux Mint. 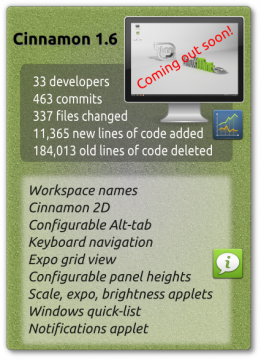 Cinnamon 1.6 has been released is coming out soon with new cool and innovative features (see the picture). 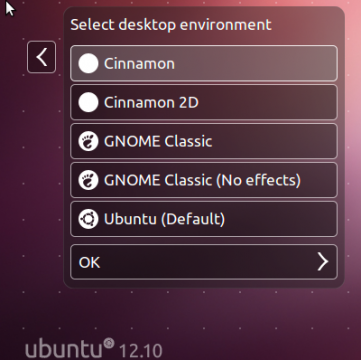 This simple tutorial is going to show you how to install Cinnamon 1.6 in Ubuntu 12.10 & 12.04. See Cinnamon 1.6 release note here. 3 users responded in " Install Cinnamon 1.6 in Ubuntu 12.04 & 12.10 "
E probado el entorno cinnamon y realmente corre bien en ubuntu, lo que te quiero pedir ya que soy un usuario novato! si podes subir las ordenes para des-instalarlo, todavía no me habituó a manejar las ordenes en la terminal! For graphical way, install Synaptic Package Manager (available in Software Center).